LG Optimus One is the company’s most popular Android powered smartphone. LG managed to sell more than 1 million units of Optimus One in just 40 days. This handset originally runs on the Android 2.2 (FroYo) operating system. 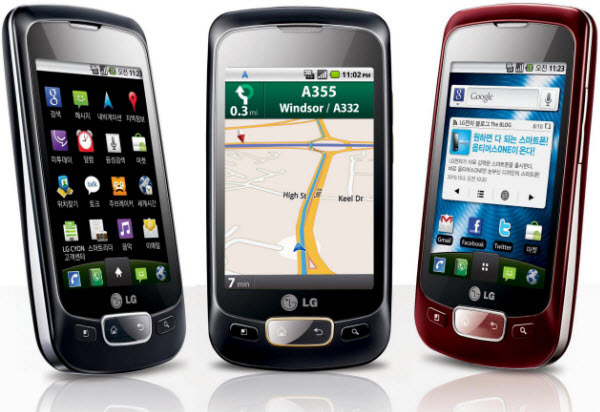 Last year, LG said that, the Optimus One will surely get the Android 2.3 (Gingerbread) update, but the exact date was not mentioned by the manufacturer. Finally, we have some good news for those, who were eagerly waiting for the Android Gingerbread update. LG Optimus One comes with a 3.2-inch touchscreen display with 320×480 pixel resolution, 600 MHz processor, Android 2.2 (FroYo) operating system, Wi-Fi connectivity, 3 megapixel camera with auto-focus, Compass, GPS and A-GPS, 3.5mm audio jack, stereo FM radio, 3G connectivity, 170 MB internal memory, 512 MB RAM, 32 GB expandable memory, LG App Advisor, 1500 mAh battery and much more. 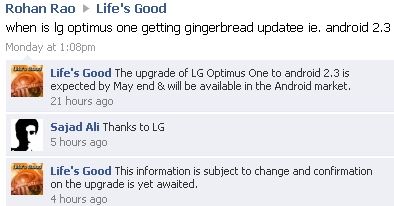 Now coming back to the good news, LG India recently posted on Facebook that the much awaited Android Gingerbread will be finally available for Optimus One in May. It means that, within a couple of months, you will be able to upgrade your Optimus One smartphone to the Android 2.3 OS. LG Optimus S users in the US, have already tasted the Gingerbread via CyanogenMod Port. To learn more, head over to this page.